transformation in a dynamic world. Driving business strategy is not an entirely new role, but it is an added responsibility to the traditional CIO job function. While many CIOs possess the skills and ambition to impact business strategy, existing IT operational models and an aging infrastructure are holding them back. 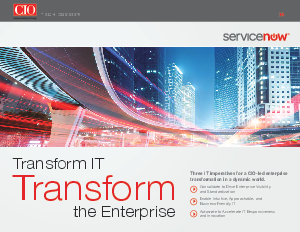 CIOs who have been successful in bridging the divide between IT and the business did it by first accelerating IT transformation.